A view of the surface of Saturn's moon Enceladus, acquired by NASA's Cassini spacecraft during a close flyby of the icy moon on Oct. 28, 2015. After a death-defying dive toward the surface of Saturn's icy moon Enceladus, the Cassini spacecraft has sent back images from its close encounter. Cassini came to within just 30 miles (50 kilometers) of the moon's surface on Wednesday (Oct. 28), and passed through a plume of material that erupts from the icy crust. The new images (which can be seen here, along with past images of Enceladus) show the rough and wrinkled surface of Enceladus, and a backlit view of the erupting spray of material. The new images are just the first pieces of information that Cassini gathered during its close approach. The spacecraft will send back more images, as well as the analyses of the plumes, done using Cassini's on board gas analyzer and dust detector. However, those tests could take several weeks to complete, according to NASA. A view of a plume coming off Saturn's moon Enceladus, acquired by NASA's Cassini spacecraft during a close flyby of the icy moon on Oct. 28, 2015. "Cassini's stunning images are providing us a quick look at Enceladus from this ultra-close flyby, but some of the most exciting science is yet to come," Linda Spilker, a Cassini project scientist at NASA's Jet Propulsion Laboratory, said in the statement from NASA. A view of Saturn's moon Enceladus, acquired by NASA's Cassini spacecraft during a close flyby of the icy moon on Oct. 28, 2015. The spacecraft is not equipped to search for signs of life, but these analyses could give clues about the environment, and whether it hospitable to life, NASA said. While scientists believe the underground ocean consists largely of water, these analyses could help reveal other chemicals that are present. The analyses could also provide information about any hydrothermal activity on the ocean floor, a heat source that would likely be necessary to support life. Cassini will make its final flyby of Enceladus on Dec. 19. The spacecraft has been studying Saturn and its moons for a decade, but its mission is scheduled to end in 2017, when it will make a dramatic series of swings between Saturn and tis innermost ring, before intentionally diving into the atmosphere of the gas giant. A close-up view of the surface of Saturn's moon Enceladus, acquired by NASA's Cassini spacecraft during a flyby of the icy moon on Oct. 28, 2015. 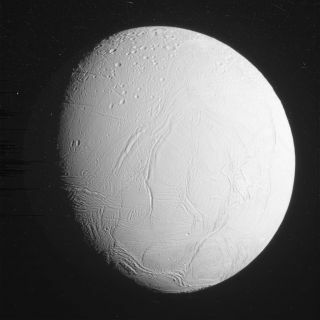 NASA has said that it is considering sending a dedicated probe to Enceladus to search for signs of life. If it comes to fruition, such a mission could launch as early as 2021. The agency already plans to launch a spacecraft toward Jupiter's moon Europa — another location that could potentially host life — in the early to mid- 2020s.